The Meekins Group was formed by Beverly Meekins. Beverly is a licensed Certified Public Accountant in both Illinois and Wisconsin. She has a B.S. degree in Accounting from the University of Illinois and a MBA from the University of Chicago. She is also a Certified Internal Auditor and Certified QuickBooks ProAdvisor and a licensed life insurance producer in the state of Illinois. Beverly is a highly experienced professional with decades of experience in multiple accounting and business related functions. She has assisted many entrepreneurs with starting up and operating new business ventures as well as contributed to the growth and development of established businesses. 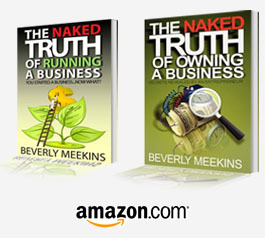 Beverly is the author of “The Naked Truth of Owning a Business” and “The Naked Truth of Running a Business”. These easy to read books are designed to share valuable tips and provide insight on business ownership to entrepreneurs. Ms. Meekins, her staff and associates are highly qualified to support your business with efficient, customized, cost effective solutions. They possess more than 100 years of combined experience in accounting, auditing, taxation, finance, strategic planning, business development, and business process re-engineering.